Speaker of the House of Representatives, Hon. Yakubu Dogara, has chided the Central Bank of Nigeria (CBN), for promulgating regulations in the financial sector without recourse to the National Assembly. 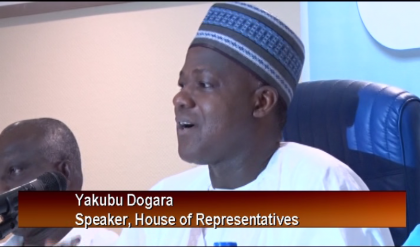 Speaking when he declared open a public hearing on organised by the House committee on Commerce on a Bill to make credit facilities more accessible to small and medium enterprises in Nigeria, Dogara, noted that the hearing would have to determine the possibility of conflict exists if the CBN Regulations and the current Bill, if passed, are allowed to exist side by side. Dogara, maintained that the Bill which is for an Act to provide for secured transactions, registration and regulation of security interest in movable assets and for related matters, also seeks to increase access to credit for business enterprises in Nigeria to stimulate economic and drive private sector development. He noted that while a majority of private enterprises, especially those in the micro, small and medium enterprises, have little or no access to credit despite their contribution to economic growth development and wealth creation, mostly because they lack sufficient collateral, the real problem is the inability to translate the capital stock of the enterprises. Delivering a speech at the event, Dogara stated, ” the bill is too important as it has potentials if properly executed to turn around the Nigerian economy and creating sustainable employments in the private sector of our economy. “The Key objective or intendment of the Bill is to increase access to credit for business enterprises in Nigeria. Access to credit is critical to economic growth and is considered as the motor for driving private sector development. However, it seems that more than seventy (70) per cent of private enterprises, typically micro, small and medium enterprises (MSMEs) have no access to credit or have very limited access. “Indeed, according to the World Bank, there are about 37 million micro, small, and medium-size enterprises (MSMEs) in Nigeria who contribute a lot to economic growth, development and job creation. However, many of these smaller businesses struggle to gain access to the capital they need to grow and prosper since they lack traditional collateral such as land and buildings. It is often the case that credit applications with banks and other lenders in Nigeria get rejected due to insufficient collateral or unsuitable collateral. In many of the cases, businesses do not even bother to apply for loans as they are certain that they may not be able to satisfy the collateral requirements, such as land and real estate, often requested by banks. “Further enquiry reveals that collateral availability is not the real challenge but the nature of the collateral. It is the inability of translating the capital stock of these enterprises, which typically constitutes assets, such as machinery, equipment or receivables into acceptable collateral that is the real problem. “Modern Secured Transaction Laws and collateral Registries have a dramatic impact on economic development. Establishing the legal framework, through legislation, for movable, non-possessory collateral lending in Nigeria will enable businesses, especially Medium and Small scale enterprises to leverage their assets into capital for investment and growth.This is bound to increase the availability of credit and reduce the cost of credit. It will unleash the real economic potentials of this nation.